Whether known as shepherd's, shepard's, or cottage pie, these savory all in one potato topped meat pies are a delicious way to use up leftovers. 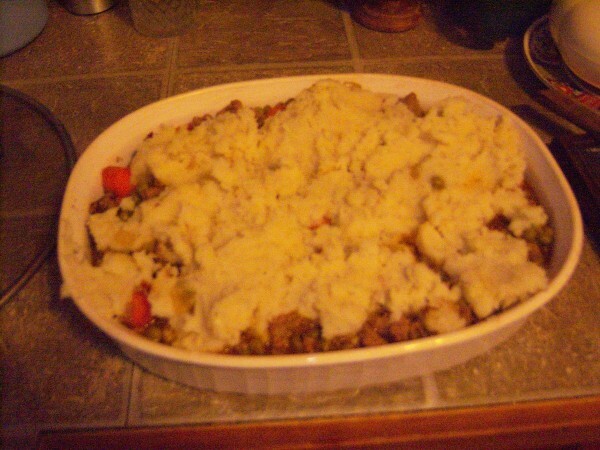 This page contains recipes for shepherd's pie. This is one of those dishes you plan leftovers for - leftover mashed potatoes, in this case. Leftover fresh veggies are nice too. 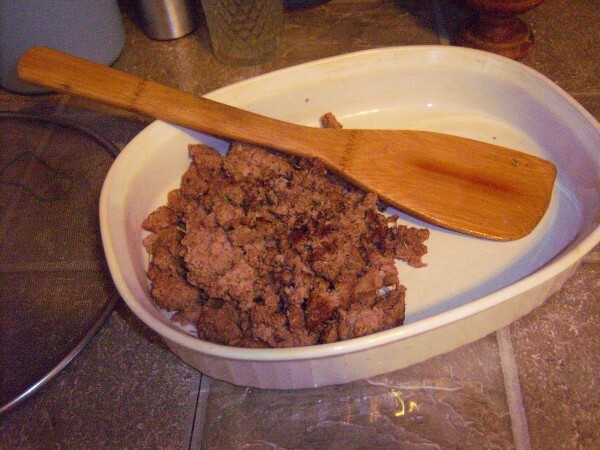 Brown the ground beef and drain the fat off. Add the herbs, onion, green pepper, and garlic, and cook until almost soft. Mix in the gravy and pour into your casserole. Mix the bag of veggies (thawed) and the cream style corn. Pour over top of the meat mixture. Mound the potatoes on top and smooth down. Bake in a 375 degree F oven until hot and bubbly, and the potatoes are lightly browned. You may like to sprinkle grated cheese over top in the last 2 minutes in the oven. I made this using ground turkey and it came out wonderful. Lots of healthy veggies inside to make a complete meal! Preheat oven to 425 F. Make 4 cups of boxed mashed potatoes according to box instructions, or use leftover mashed potatoes. Heat 1 Tbsp. 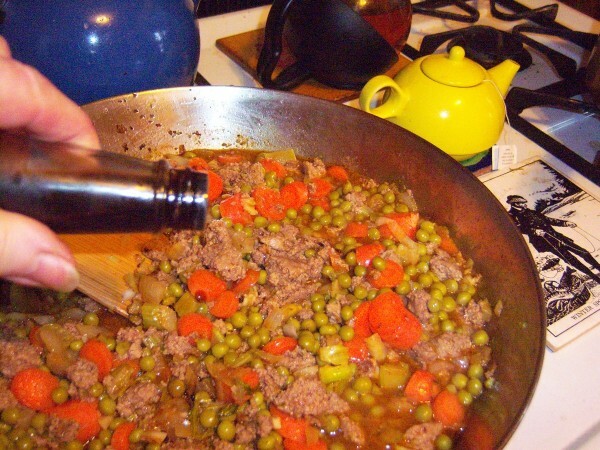 oil in large skillet and add ground meat. Cook until browned. Break up and transfer to baking dish. Wipe out skillet (or it will brown like mine did in the photo!) Add 1 tbsp. 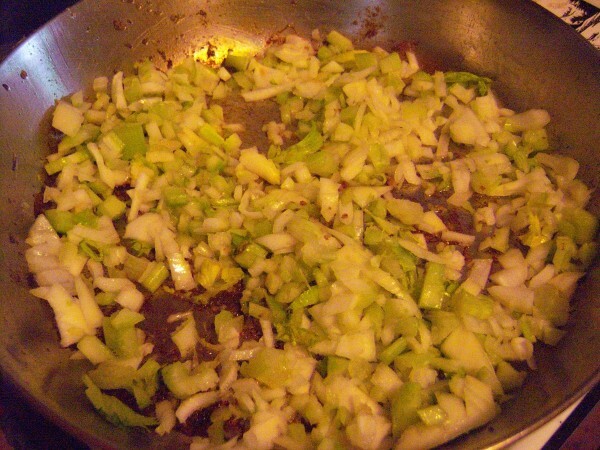 oil and add chopped onion, celery and garlic, stirring occasionally until golden about 5 minutes. 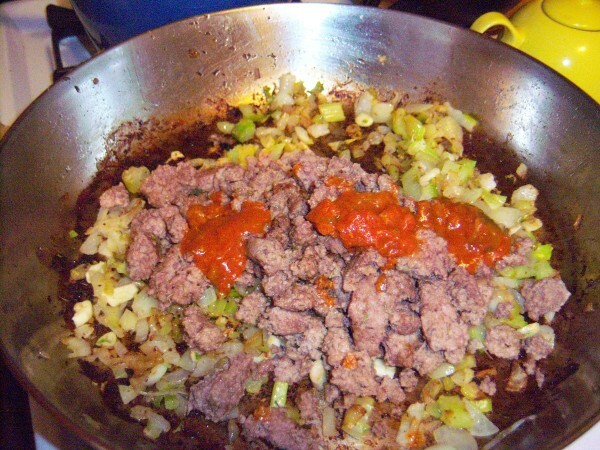 Return meat to skillet and stir in tomato paste cooking one minute more. Add chicken stock and simmer for 7 to 8 minutes. Add carrots, peas and Worcestershire sauce. Stir for about 4 minutes. Transfer mix to a 9 X 13 inch or 3 quart baking dish. Spoon and spread mashed potatoes on top. Bake until filling is golden brown in spots on top, about 20-25 minutes. This recipe is my son-in-law's Grandmother, who makes it with Pork and Beans! This recipe is as versatile as my imagination can make it. And so very easy! It also never fails to please anyone I've ever served it to - even the fussiest of kids love it! A little twist on this long time dish. Mix onion and ground beef together and place in a roasting pan. Sprinkle corn over top evenly. Pour the broth over top. Recipe for Elegant Tuna Shepherd's Pie. Combine the tuna, peas, carrots, mushroom pieces, soup and milk and mix well. Beat the onion into the mashed potatoes. Arrange half of the potato mixture in a greased 2 qt. 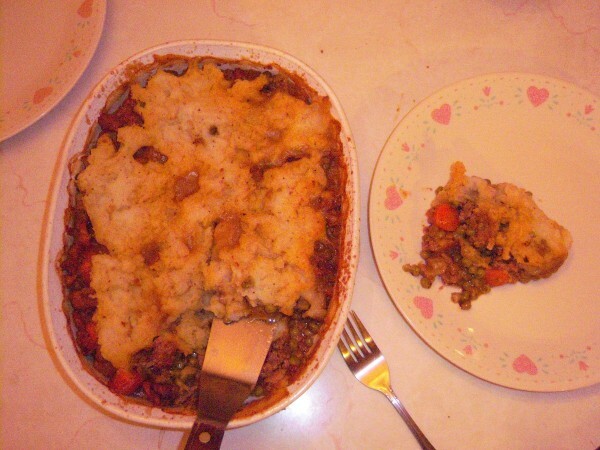 casserole and top with the tuna mixture. Tips and recipes for making Shepherd's Pie. Brown the ground beef and drain grease. Stir in the Italian seasoning and beef broth. Slowly add the flour until thick. In a 9x13 inch greased pan put a layer of the meat mixture on the bottom. A twist to the Shepherds Pie. I needed a twist and this is so yummy that I think the regular one is no more. Simple, easy and good. This Tater Tot Casserole recipe is an easy kid-friendly twist on Shepherd's Pie that pleases everyone with its crispy tater tots, melty cheese, and beefy filling! Parents will appreciate the fact that nutritious veggies are mixed in and that it's a perfect meal-in-one. Try it on the "meat and potatoes" lovers in YOUR family! Preheat oven to 450 degrees F. Spray 1 1/2 qt baking dish with non stick cooking spray. Press cold potatoes onto bottom and up the sides of casserole dish. Bake for 20 minutes or till edge is golden. Shepherd's and cottage pies originated in Britain. I think they were ways of taking leftovers and making them into something different and delicious. 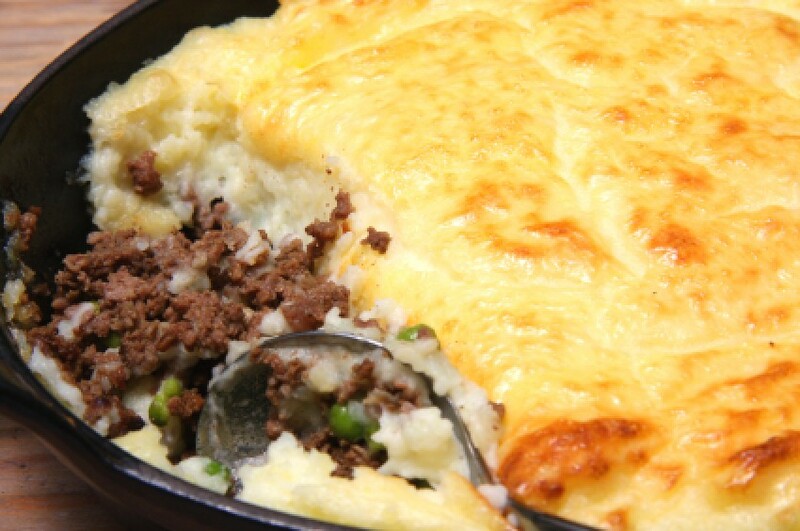 What we call shepherd's pie, made with ground beef, is actually cottage pie. 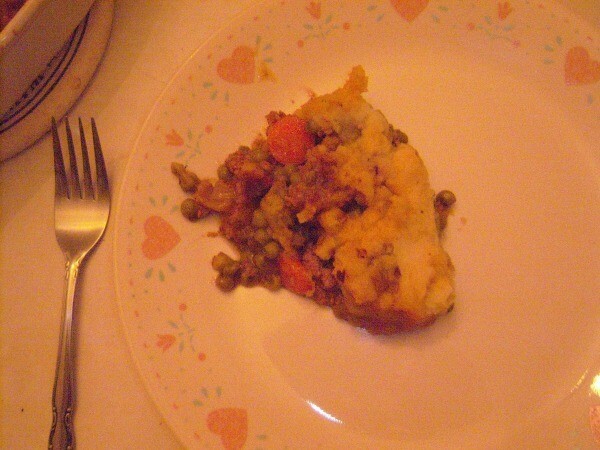 Shepherd's pie is made with lamb, ground or small chunks, thus the "shepherd". Either way, they are both great examples of good comfort food. I have seen many, many recipes for shepherd's pie. But I think it is one of those dishes that, if you know the basics of how it is made, doesn't need a recipe. It is easiest to make when you plan a good meal to have leftovers. My favorite uses leftover roast beef, gravy, vegetables, and mashed potatoes. To make it this way, make a nice roast beef your favorite way, with lots of good, rich gravy. Make extra mashed potatoes, and extra veggies; whatever veggies you think would be good in your pie. The next day, mix the drained veggies, and the meat, cut into bite-size chunks, into the gravy, and whatever herbs you like. Heat it on the stove until it's nice and bubbly. Put all of it into your baking pan, or casserole. The next step is the mashed potatoes. You can mix some shredded cheese into them. Cheddar is traditional cheese. Then spread the potatoes across your meat mixture, covering it all. This is easiest when you warm up the potatoes in the microwave. Then put it in a 325 degree F oven until it is heated through and the potatoes are lightly browned; about 30 minutes. 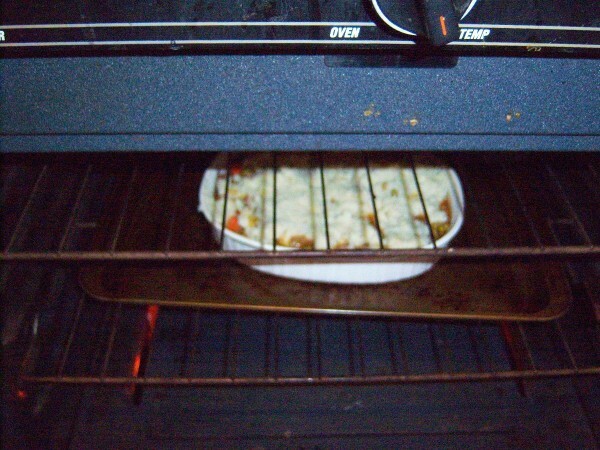 You can sprinkle cheese across it now, then put it back in the oven until it is melted. This can be made exactly the same using leftover roasted lamb. If you don't have gravy with your lamb, you can use jars of chicken or beef gravy. Rosemary is a wonderful seasoning with lamb. 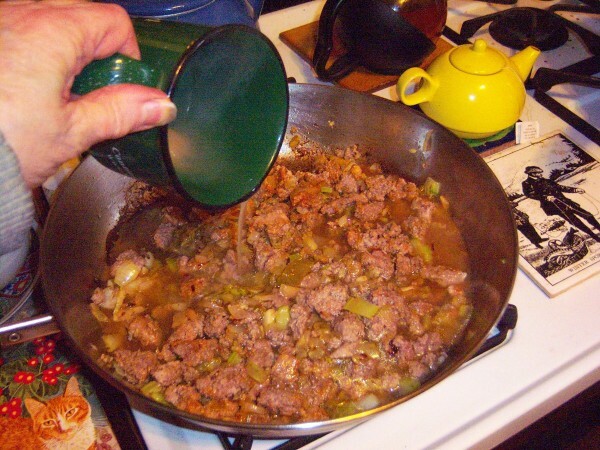 A more common recipe calls for browning ground beef or lamb with onions and maybe a little garlic. Then you add in frozen mixed vegetables and herbs. Top with mashed potatoes and cheese and bake. The point is, make it to your taste! The basics are simple, meat and veggies in gravy, topped with mashed potatoes, and maybe some cheese. Use the meat you like, the herbs and veggies, and cheese you (and your family) like. It would even be good as a vegetarian dish, with veggies and herbs in your sauce of choice topped with mashed potatoes. Want another change of pace? Mash the potatoes with carrots, parsnips, or turnips mixed in. Home cooking can be so creative. When you start straying from the recipe, or even making up you own dishes, you are expressing yourself and choosing the flavors and ingredients that appeal to your family. This is when the kids start talking about "my mom's/dad's recipe for...". If you are a beginning cook, try changing a recipe just a little. Maybe you will like it better with more garlic, or dill instead of basil, or with any change you happen to be thinking of. Shepherd's/cottage pie can be a good place to start. When I was a child (50 yrs ago), Mama made a sort of "Shepherd's Pie" that had ketchup, as some of the burger ingredients and mashed potatoes and peas for the topping. I've tried to duplicate it and always end up with a recipe that's not as simple as hers. I think she got the recipe from a can of peas. Any ideas? Thanks. Brush casserole dish with melted butter or oil. Preheat oven to 375 to 415 degrees F (hot). Trim meat; cut into cubes or grind. Melt drippings or butter in a large pan. Add onions and cook until golden. Sprinkle in flour and mustard; gradually add stock. Stir until smooth. Bring gravy to boil; reduce heat and simmer for 3 minutes. Stir together meat, parsley, mint (if lamb), pepper, salt and gravy. Remove from heat and spoon into dish. Topping: Combine potatoes, milk, salt, and pepper. Mix until smooth and creamy. Spread evenly over meat. Rough up surface with a fork. Bake 40-45 minutes. Potato topping should be golden brown. Does anyone have a shepherd's pie recipe? There should be that type of recipe in cookbooks or else google it and see what you come up with. My husband and I really liked this one using carrots instead of mixed vegetables. 1. Bring a large pot of salted water to a boil. Add potatoes and cook until tender but still firm, about 15 minutes. Drain and mash. Mix in butter, finely chopped onion and 1/4 cup shredded cheese. Season with salt and pepper to taste; set aside. 3. Heat oil in a large frying pan. Add onion and cook until clear. Add ground beef and cook until well browned. Pour off excess fat, then stir in flour and cook 1 minute. Add ketchup and beef broth. Bring to a boil, reduce heat and simmer for 5 minutes. 4. 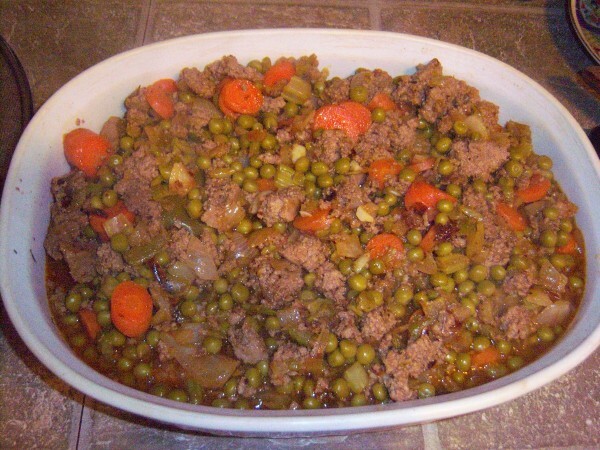 Spread the ground beef in an even layer on the bottom of a 2 quart casserole dish. Next, spread a layer of mashed carrots. Top with the mashed potato mixture and sprinkle with remaining shredded cheese. 5. Bake in the preheated oven for 20 minutes, or until golden brown. Can't give you measurements on this but here is what I do. Fry hamburger. Drain. 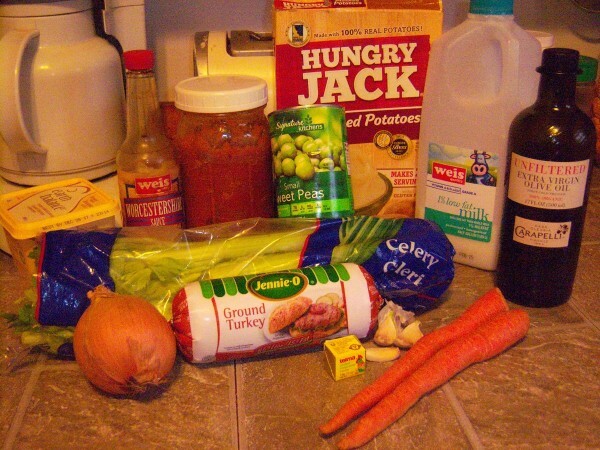 Add 1 large can of vegetable beef soup. My hubby requested sauteed onions & cooked carrots to add also. Place in baking dish. Top with mashed potatoes. Sprinkle on cheese if you like. Bake @ 350 to desired heat & enjoy! 1 1/2 lbs hamburger, ground round or something that does not have a lot of fat. You can add whatever you want to the hamburger; onions, peppers, etc. while you brown the hamburger. Drain hamburger when done. Drain 2 can of corn or favorite vegetables (in cans), I have found corn seems to give this a really good taste. Using the regular soup size cans for your vegetables. Empty drained corn over hamburger and spread around on top. Last thing to do spread potatoes over corn. Add a little butter and some pepper on top or cheese, whatever your little heart desires. Do not cover you do not have to grease the pan either. Put into 350 degree F oven. Bake for 30 minutes or the potatoes are golden brown. Note: The nice thing about this recipe is the fact that you can put it together so quickly and you can put it together the night before also using anything but aluminum pans to keep in the frig. Take it out and bake. If you do this it will take a little longer to bake. depending on how your oven heats. I would say at the least 15 min extra. You can make a salad or have rolls to add to the meal because every thing you need is right there in that pan. I love it! I hope anyone who tries this will like it just as much as I do. You can do just about anything you want for this recipe to make it your own. It's quick and easy and you usually have the items on hand. Source: The source is my Mother in law, I have been making it for about 30 years. I make this twice a month. I prefer the taste of frozen veggies, microwaved first and then added, they stay crispy this way.I use the frozen mix of peas and carrots (be careful with the lima beans, they can be hard) and green beans. If you have any cook the veggies in some stock, for even better flavor, or dissolved bouillon plus water per the directions. Also I save some gravy whenever I make a roast and freeze it, I add it to the beef after its browned. I don't add onions to mine, I don't know why I didn't like the flavor, even though I love onions. PS I use only 1 lb of ground beef with good results and if you are using instant potatoes, make the recipes that serves 8. That gives good coverage.